A canoe trip on the river Kongeå is a unique and very special experience. As you silently glide through the water, you can experience the nature in a whole new perspective. The fish swim peacefully under your feet, and the ducks continue their uninterrupted pursuit of duck food. The first part of the river is narrow and you will sail under tall, old bridges. But the Kongeåen rapidly spreads out in the landscape, and you will soon be sailing through open fields and meadows with orchids and pink ragged robin. If you are lucky, you might see yellow iris, water crowfoot, kingfishers and otters. When you go sailing on the Kongeåen, you are actually sailing right in the middle of an important chapter of Denmark's history. The river Kongeå marked the border between Denmark and Germany until the reunification in 1920. You can go canoeing on Kongeåen from Andst Bro to Kongeåslusen (Kongeå sluice) by the Wadden Sea. The trip is about 50 km long. You can start your trip at Søengevej, just east of Vejen. There is a site here where you can launch your canoe into the water. The site also has picnic tables and benches and offers car parking facilities. You will sail on the Andst Å river for the first half hour. By Knag Mølle (Knag Mill), you sail into the river Kongeå. You can take a break at Hermansens Høj, which is about 800 metres after you have passed the mill 'Knag Mølle'. Here you will find a campfire area, picnic tables and benches. A little further up the river, you will find Vejen Fodboldgolf (Vejen Football golf) with shelters, toilets and covered picnic tables and benches. A little later, Frihedsbroen will appear. There is a camping area here, with shelters, toilets and campfire area. You will also find an information stand with hotspot. A good 8 km from Frihedsbroen, you will come to Foldingbro Camping. There is a launching place here and toilets. You can also buy some provisions at Foldingbro Camping. In Foldingbro you will also find the inn 'Kongeåkroen'. At Villebøl, you will find another shelter and Kongeå Camping. From Villebøl it is 15.2 km to Vislev, where the next launching site is. There are also shelters here. The trip ends at Kongeåslusen, which is 5.2 km from Vilslev. There are also overnight shelter facilities here. It may be necessary to carry the canoe past various obstacles at a number of places. See the various places on the map. 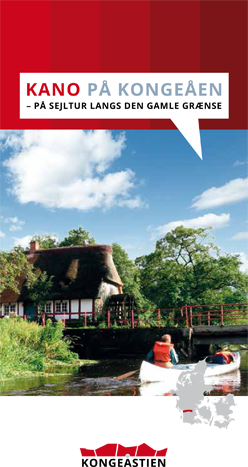 It is a good idea to have information about the river Kongeå right at hand. Download the app Kongeåen on your smartphone.